The 2018 Kawasaki Z125 PRO KRT Replica is as it’s name says, but it’s not a mechanical clone just graphics and cosmetics. (KRT Kawasaki Racing Team) The regular Z125 was released in 2016. 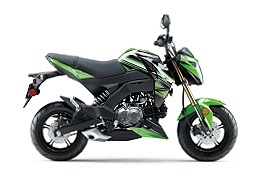 The Kawasaki Z125 is a direct competitor to the Honda Grom which the the current market leader by having a cult following. These are mini motorcycles that can be ridden on public roads and are aimed at joy seekers or perhaps really short people. Alternatively this is a more niche choice for learners riders as it is catergorised as a LAMS model. 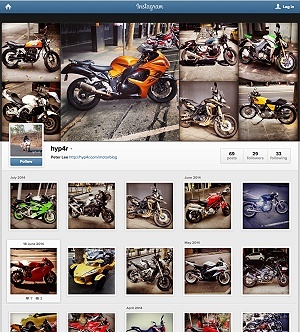 In terms of looks, construction and design the Kawasaki claims the Z prefix from Kawasaki’s much larger Z motorcycles. However the Z125 doesn’t really look like any of them. The designer’s self is looking on the cheap side especially next to the arch rival GROM and also does’t indicate how fun these bikes are supposed to be. That said the materials and build quality are good and in line with the cheaper motorcycle range. In terms of engine tech it’s all very modern to extract so much power from 125cc which is less than half a cup of water! It’s fuel injected with air cooling for simplicity and less weight. The USD forks are a nice touch along with the disc brakes which are clearly over kill for such a slow motorcycle. In terms of competition there are a ton of competitors from the known motorcycle brands of KTM, Suzuki, Honda and there are plenty of other lesser known manufacturers. Which one you choose will probably be dependent on price and how much they can be modified. Lets face it bikes are not daily rides for most riders. That said the bigger bikes like the Duke 125 and the new GSX-R125 are bigger and have a fraction more power but it much of a muchness in terms of performance. If you like the look and want to join the mini-motorcycle class then is a great choice. While I prefer to Honda From due to it’s looks and enhancement repetiore that’s no reason why Kawasaki and aftermarket suppliers will jump on to this new competitor in the class. In terms of price, it’s on the road for around $5000 is cheap by new motorcycle standards but is on the expensive side for a 125cc.